In the late 1700s, when Euro-Americans began to visit the Northwest Coast, they reported the presence of vigorous, diverse cultures—among them the Tlingit, Haida, Kwakwaka’wakw (Kwakiutl), Nuu-chah-nulth (Nootka), Coast Salish, and Chinookans—with a population conservatively estimated at over 180,000. A century later only about 35,000 were left. The change was brought about by the introduction of diseases that had originated in the Eastern Hemisphere, such as smallpox, malaria, measles, and influenza. The Coming of the Spirit of Pestilence examines the introduction of infectious diseases among the Indians of the Northwest Coast culture area (present-day Oregon and Washington west of the Cascade Mountains, British Columbia west of the Coast Range, and southeast Alaska) in the first century of contact and the effects of these new diseases on Native American population size, structure, interactions, and viability. The emphasis is on epidemic diseases and specific epidemic episodes. In most parts of the Americas, disease transfer and depopulation occurred early and are poorly documented. Because of the lateness of Euro-American contact in the Pacific Northwest, however, records are relatively complete, and it is possible to reconstruct in some detail the processes of disease transfer and the progress of specific epidemics, compute their demographic impact, and discern connections between these processes and culture change. Boyd provides a thorough compilation, analysis, and comparison of information gleaned from many published and archival sources, both Euro-American (trading-company, mission, and doctors’ records; ships’ logs; diaries; and Hudson’s Bay Company and government censuses) and Native American (oral traditions and informant testimony). The many quotations from contemporary sources underscore the magnitude of the human suffering. 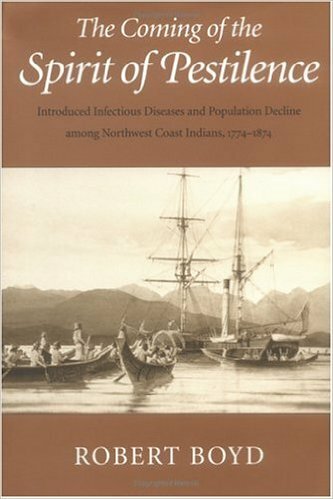 The Coming of the Spirit of Pestilence is a definitive study of introduced diseases in the Pacific Northwest.